When I was a little girl, I would squeal with delight as I ran through the park picking up every dandelion I could find and making a wish. The other day I saw a dandelion and had a flash of myself as a child. I smiled as I blew and made a wish. This time my wish was that every hypothyroid person following Hypothyroid Mom finds wellness. I don’t mean just feeling “alright”. I mean feeling INCREDIBLE. There is hope to feel incredible with hypothyroidism. I know because hope happened to me. This guest post is written by Dr. Hugh Melnick. He has hypothyroidism himself. Yes, men get hypothyroidism too. He knows what it’s like to be hypothyroid because he lives it himself. Written by Hugh Melnick, M.D., F.A.C.O.G. I would like to tell you about using THYROFLEX TESTING for the diagnosis and management of hypothyroidism. Blood tests, especially TSH (thyroid stimulating hormone) levels, have limited value in diagnosing hypothyroidism. Many individuals have “normal” TSH levels, yet still suffer with the classical symptoms of hypothyroidism. Likewise, when the level of TSH in the blood is used to determine the “ideal” dose of thyroid medication, many people still remain symptomatic. Since thyroid blood testing does not detect many cases of hypothyroidism, symptomatic individuals are often denied treatment that would greatly improve their health. Unfortunately, many physicians are not comfortable diagnosing hypothyroidism on the basis of a patient’s clinical symptoms, especially when their blood tests fall within the “normal” range. These physicians require objective evidence that a symptomatic individual is actually hypothyroid before offering treatment. Physicians, as well as symptomatic individuals, must be made a aware of an alternate method of thyroid testing that can be used to confirm the diagnosis in symptomatic patients who have normal blood tests. For this reason, it is really of utmost importance to raise public awareness of THYROFLEX TESTING, a little known and underutilized method that can be used for making a diagnosis of hypothyroidism, and for determining the optimal dose of thyroid medication for symptomatic patients. The Thyroflex Test, developed by Dr. Daryl Turner, is able to determine a person’s thyroid status based upon the measurement of conduction velocity through a tendon reflex. The connection was made late in the 19th century when doctors, studying patients with hypothyroidism, observed that clinically hypothyroid individuals had very slow or absent tendon reflexes. A tendon reflex is a movement of a muscle caused by the stimulation of a nerve that controls the muscle and causes it to move involuntarily. The speed at which this reaction occurs is an indicator of cellular function. The lower the speed of conduction, the lower the cellular energy and function. Cellular function is ultimately controlled by T3, the most biologically active thyroid hormone. Low levels of T3 within the cells of the body result in diminished cellular function, which ultimately cause people to suffer with the clinical symptoms of hypothyroidism. Since blood tests cannot measure the level of intracellular T3 (level of T3 hormone located inside the cells), one way to objectively test cellular function is by measuring the speed at which a nerve impulse is conducted through nerve and muscle cells. A slow rate of nerve conduction demonstrates low cellular function and confirms a diagnosis of hypothyroidism. Thyroflex testing can also be used for establishing the optimal dose of thyroid medication for symptomatic individuals. Using the Thyroflex, a physician can immediately see if the patient’s dose of thyroid medication is adequate by the velocity of their nerve conduction. When slow nerve conduction is found with Thyroflex testing, an increase in the dose of thyroid medication is needed if the patient is symptomatic, irrespective of blood test results. This is especially true when a patient is taking Natural Desiccated Thyroid (NDT), since physicians unfamiliar with it are often confused by blood test results when patients are taking NDT. In my experience, there is an excellent correlation between Thyroflex results and patients’ clinical symptoms. As compared to Thyroflex testing, there is a poor correlation between TSH levels in the blood and patients’ symptoms since approximately 40% of patients on thyroid medication have TSH levels in the ideal range, but still experience symptoms. How is the Thyroflex testing performed? The patient is connected to the Thyroflex computer by placing a sensor above the middle knuckle of the left hand. A spot above the brachioradialis tendon (in the forearm) is identified, where the nerve will be stimulated. When stimulated, the tendon will make the middle finger move involuntarily. The time interval between the stimulation of tendon and the involuntary movement of the middle finer is measured by the computer. The average speed of conduction is calculated, indicating the level of intracellular thyroid function. This test causes no discomfort to patients. The symptoms of hypothyroidism are the result of inadequate levels of T3 inside the cells of the body. Low levels of intracellular T3 cannot be detected by the levels of thyroid hormones in the blood. In the hypothyroid state, low T3 levels within the cells cause the cells of the body to produce inadequate amounts of energy which result in the symptoms experienced by hypothyroid individuals. Slow nerve impulse speed, as indicated by Thyroflex testing, demonstrates low cellular function which correlates with clinical symptoms. The bottom line is that diagnosing and treating hypothyroidism according to patients’ symptoms is very effective. Knowledge of the many symptoms of hypothyroidism is the key to its diagnosis and treatment. However if a physician requires objective proof of the existence of hypothyroidism prior to treating symptomatic patients with normal blood tests, Thyroflex testing can be used to confirm the clinical diagnosis. 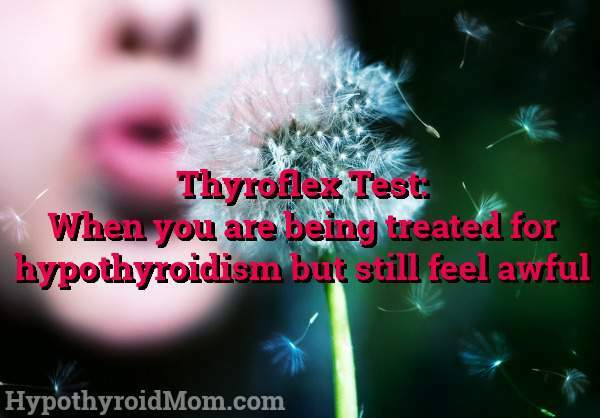 If a patient is being treated with thyroid medication and remains symptomatic, Thyroflex testing can immediately determine if an increase in dosage is needed to relieve the patient’s symptoms. In my clinical experience, Thyroflex testing is more sensitive than are blood tests, in determining the optimal dose of thyroid medication. About Hugh Melnick, M.D., F.A.C.O.G. Dr. Hugh D. Melnick, M.D. is a reproductive endocrinologist who has been treating patients with hormonal and fertility problems since 1976. In 1983, Dr. Melnick founded Advanced Fertility Services, which was the first free standing In Vitro Fertilization Center in New York City and is still its medical director. He has been impressed by the large number of infertile women that he has seen over the years, who are symptomatically hypothyroid, and who conceive after treatment with thyroid medication. Dr. Melnick is one of the incredible experts I interviewed for my book Your Healthy Pregnancy with Thyroid Disease: A Guide to Fertility, Pregnancy, and Postpartum Wellness. This sounds like exactly what I need. Does anyone have personal wxoeriencecwith Dr. Melnick? Wow! This explains my observation that when I was hypothyroid tired I would knock something off and it would just fall to the floor (reflexes too slow to catch it), but when my thyroid was treated and I was anemia tired, I would clumsily knock things off but I could usually catch them. Did not know that was not just me.